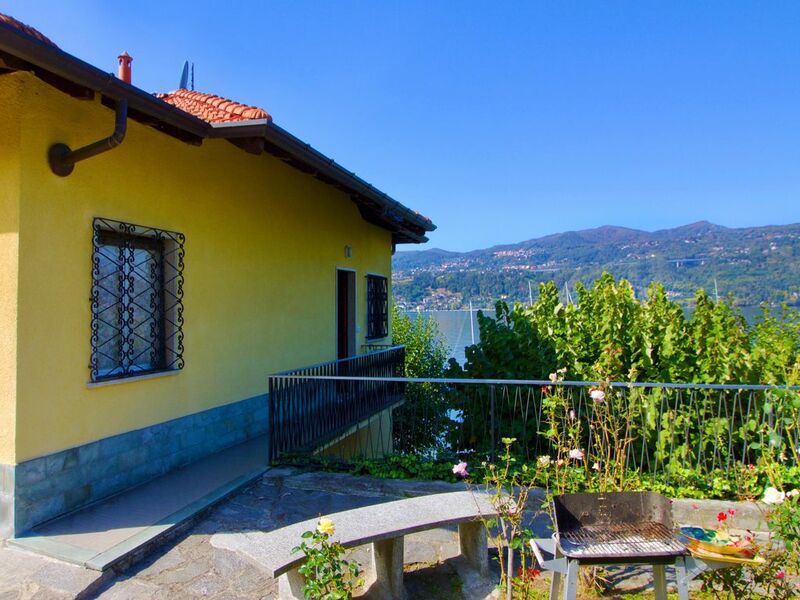 Hop on a boat or dip into the lake, from this effortless family-friendly retreat on the banks of Lake Maggiore! Boasting an exclusive-feeling lakeside setting, this modernised ‘Darsena’ style villa with boat mooring provides a tranquil, authentic holiday ambience from which to make the most of beautiful Lake Maggiore. Inside, the lateral-level villa provides a lovely inviting flow for family and friends to enjoy and feel at home in. A modern lake view sitting room provides a stylish ambience for kicking back; with a favourite programme or film on the flat screen SAT TV with DVD player. A book-games library also provides timeless all-weather amusement. A lovely lake view Kitchen Diner accompanies the open plan sitting room. Accompanied by a breakfast table, the Kitchen provides every excuse to wine and dine away; with a cooker hob, toaster, coffee machine, dishwasher and fridge freezer to hand. Families will find the 3 bedrooms perfectly suited for flexible groups of 6. A spacious Double bedroom features in an open space, inter-connected with a child-friendly sleeping space with bunk beds (to reach the Double bedroom, guests must first walk through the bunk bed space). A light and airy other bedroom provides a flexible Single bed and pull-out Single option for 2. A modern fitted shower room and private laundry facilities offers added convenience for easy-going family stays. Outside, the private two-tier lakeside garden sets the scene for carefree holiday relaxation. The sunny private garden which is situated on the entrance-level promises an effortless setting for ambient alfresco entertaining; with a BBQ and dining terrace provided. The next level down features a partially-shady lakeside garden with mature trees; for a tranquil haven is which to read, sunbathe and dip into the lake for a swim. A private boat mooring facility and access to a small shingle beach are also provided. A private parking space can be found by the gated entrance of the modern villa. The holiday retreat is situated within easy reach of a boat rental service, a public lake beach and the popular modern lakeside bar-restaurant ‘Bar il Molo di Ranco’. Centrally situated in Ranco along ‘Lungolago Dino Ciani’, guests are placed a 1-minute drive from a stylish bar, selections pizzerias, tavernas restaurants and the lakeside amenities (which include the marina, the ‘Cantiere Nautico Brovelli’ boat rental service and the lake beach ‘Spiaggia dei Caravelle’. From the holiday retreat, guests are also within a 20-24 minutes’ drive from Reno Leggiuno; a town popular for its shingle lake beach with boat rental opportunities, its’ famous UNESCO world heritage site of ‘Santa Caterina del Sasso’ and its authentic selection of eateries (which include a seafood restaurant, a pizzeria and ‘gelateria’ no less!). For those looking to sightsee on Lake Maggiore, Laveno offers easy ferry links across the lake to the western shore town of Intra (perfect for reaching the Villa Taranto gardens, the beautiful resort of Stresa and the world-class Borromean Islands. The closest airport is Milan Malpensa, just 37 minutes’ drive away.